By Scott Gilfoid: If and when Kell Brook and Amir Khan get around to fighting each other, former IBF 147lb belt holder Shawn Porter expects Khan to win the fight. Porter says he’ll then look to fight Khan afterwards. He’s open to fighting Brook if he wins too. Porter doesn’t care as long as he gets a chance to fight the winner of that fight. Right now it’s still unclear whether Brook and Khan will actually be fighting in 2016. Khan told Brook’s promoter Eddie Hearn that he’ll agree to fight Brook in 2016 if and only if Brook beats two high caliber fighters before that time. I guess this information has been lost on Brook, because he’s blabbing about how he’s only one fight away from fighting Khan. Maybe Brook wasn’t paying attention when Khan told Hearn that Brook has to beat two good fighters before he’ll fight him, or maybe Brook thinks Khan is desperate now and will agree to fight him if he fights one fringe contender. The fringe contender that Brook may be fighting next is Diego Chaves on October 24th. I don’t know about you, but I see Chaves as being essentially the same as if Brook were to fight Brandon Rios, and I don’t rate Rios as a good fighter. A real test for Brook would be Keith Thurman, Marcos Maidana, Shawn Porter, Tim Bradley or Errol Spence. If Brook can’t beat at least two of those fighters before 2016, then I think Khan should wait until he does, or at least attempts to, because a fight between Brook and Khan won’t be a big affair unless Brook starts beating quality fighters instead of the Frank Gavins and Jo Jo Dans. Let’s be real about this; Porter is probably not going to get a chance to fight the winner of Brook vs. Khan. 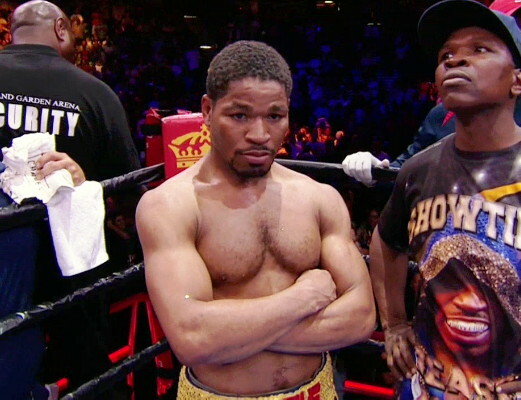 Brook got his narrow win over Porter last year by clinching 24/7, but now that Porter knows how to defeat that tactic, Brook is going to avoid him like the plague otherwise he’s going to get beaten worse than Adrien Broner did. As such, I definitely don’t see Porter getting a fight against the winner of the Khan-Brook fight. No way is Khan going to fight a guy like Porter, and the same with Brook. It’s just not going to happen. I’ll so far as to say that neither of those two fighters will ever face Porter unless it’s for a conversation to say hi to him. Porter is going to have to wait around for Keith Thurman and Danny Garcia to fight him, because I doubt either of them will get anywhere near him until 2017. That’s my prediction. They won’t fight him in 2015 because there are other easy fights that can get made. They won’t fight Porter in 2016, because there won’t enough pressure on them to take the fight with him. But with Porter winning and looking great in 2015 and 2016, the pressure will be too much for Garcia and Thurman to avoid Porter by 2017.